For three years now, my Rhubarb Custard Bars have reigned supreme on this blog, breaking records as the most commented upon, most downloaded, most favourited recipe that I have posted. It’s a great recipe, but I think this says more about our communal love for rhubarb than anything else. Rhubarb is the herald of spring in these parts (for a cook, at least). Sure, nettles. 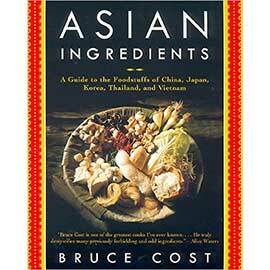 Yes, brassica tops. But RHUBARB is made into a dessert. Rhubarb acts like the first fruit of the season, even though it is actually a vegetable – it’s a stem, not the ovary of a flowering plant, am I right? Even so, rhubarb’s tangy deliciousness and vibrant pink colour make for a pretty fruity experience. I know I get very excited about it; and I know I’m not alone. I almost hyperventilated when a friend gifted me some of her first crop of rhubarb a couple of weeks ago. She nodded knowingly as she handed it over. The very next day, another friend who has booked me to make her wedding dessert, informed me that said dessert “must involve rhubarb”! I have the feeling that any celebration right now must involve rhubarb. 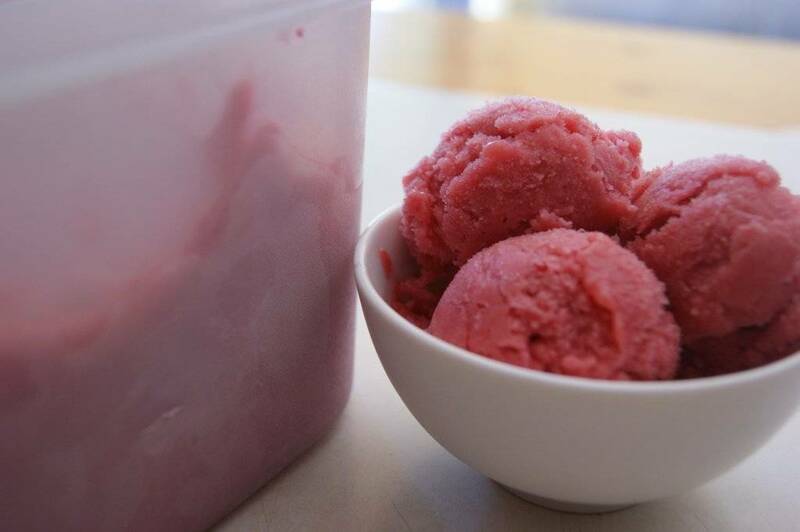 Well, it doesn’t get any more rhubarby than this: Rhubarb Sorbet. It’s like the distilled essence of rhubarb. Tangy and sweet, perfectly pink, unsullied by either strawberries or oatmeal crumble or cream. This is for rhubarb-lovers only, but I imagine that leaves very few people out. Makes 2 quarts (to perfectly fit my awesome Cuisinart Ice Cream maker) but can easily be cut in half. This is perfectly, intensely rhubarby. If you don’t have an ice cream maker, you can freeze this in a large baking pan, but the texture will be much more firm and heavily crystallized. Trim green ends off rhubarb and wash the stalks well. If desired, place the trimmed stalks in cold water to soak for 10 minutes. This an old British culinary trick to help remove some of the acid from the rhubarb. I’ve yet to determine the efficacy of this trick, but I do it anyway. 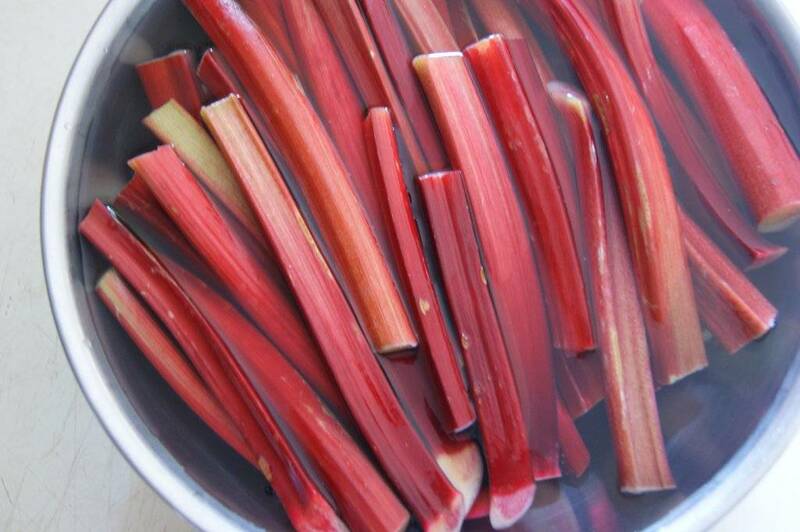 Cut the rhubarb into small pieces, and place in a large pot. Add the sugar, water, salt, and vanilla bean. The vanilla bean should be split lengthwise to help release its flavour. Bring mixture to a boil, reduce heat and simmer, uncovered, for about 10 minutes, until rhubarb is very soft. Remove from heat and let mixture cool for about 10 minutes. Remove vanilla bean pod and discard. Add 1 tablespoon of lemon juice. Puree the rhubarb mixture in batches in a blender until smooth and very finely pureed. I am lucky enough to have a Vitamix, which makes this very easy, but any decent blender should do the trick. If you find that the sorbet mixture has not become smooth enough, you have the option of pushing it through a mesh sieve to remove the fibers. 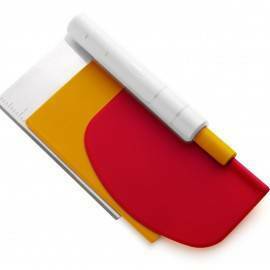 Or you can live with a little texture in your sorbet. 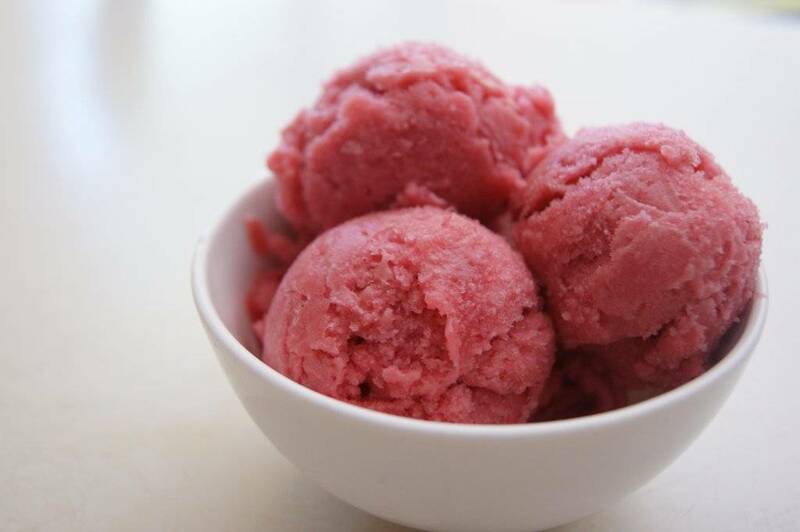 Taste the sorbet mixture. If it is a bit too sweet, add the remaining lemon juice, one tablespoon at a time, until the desired balance of sweet and tangy is reached. Transfer mixture to a clean, seal-able container (I usually use a couple of large mason jars) and store in the fridge overnight, or until well-chilled, at least 4 hours. 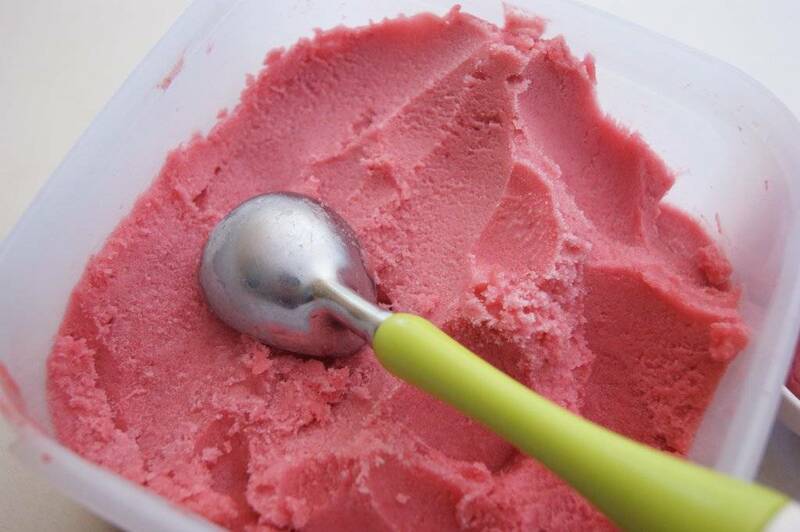 Transfer sorbet mixture to an ice cream maker and freeze according to the manufacturer’s directions. 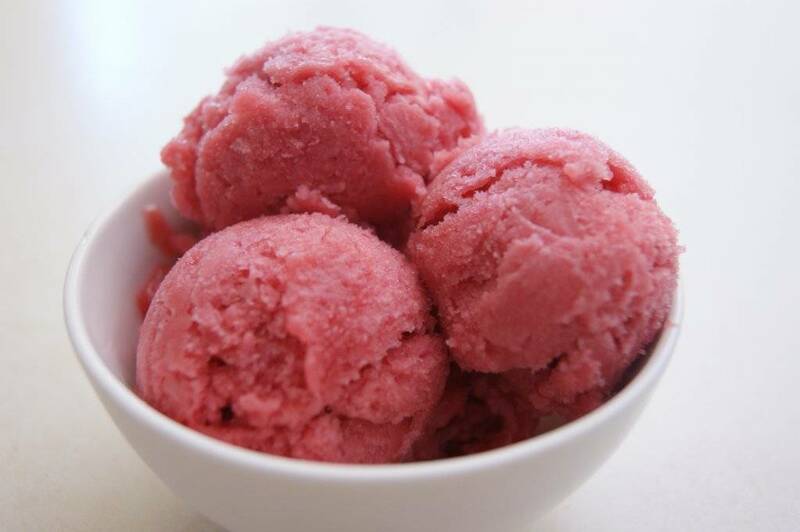 Rhubarb sorbet stores well in the freezer for up to 3 months.